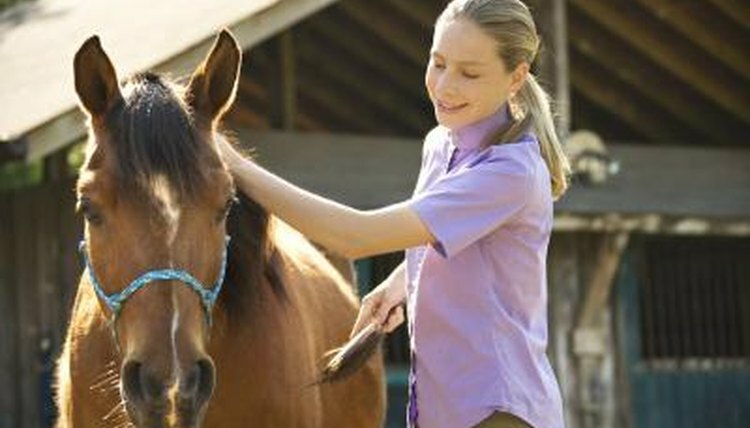 Regular grooming is an important part of being a horse owner. Grooming before you ride gives you a chance to inspect your horse for any cuts or injuries, while grooming after riding removes sweat and gives your horse a chance to cool down before being put away. Having the proper tools, and keeping them together in a bucket or tote, makes the grooming process easier. Use the rubber curry comb in small, circular motions, starting behind your horse's ears and moving toward the tail. Do not use the rubber curry on your horse's face or below the knees. The curry is too rough to use on these bony areas. The rubber curry penetrates through the horse's coat and lifts dirt and dead skin cells to the top of the coat. Knock the dust out of the curry comb frequently by hitting it on the bottom of your boot or a nearby wall. After currying your horse, use the stiff bristled dandy brush to remove the dirt you have raised to the surface. Use short, quick flicks of the dandy brush, rather than a long, sweeping motion. If your horse is sensitive while being groomed, avoid using the dandy brush on his face and below his knees. The body brush looks similar to the dandy brush, but has soft bristles. You can use this brush over your horse's entire body. Use long, sweeping strokes to smooth the coat down and bring the natural oils to the surface. Pay special attention to the area behind his front legs and his head, where the bridle will lay. Dirt and dried sweat in these areas can lead to irritation where the bridle and girth rest. While not strictly brushes, there are other grooming tools that you may find helpful when grooming your horse. Rubber grooming mitts are more gentle than the rubber curry comb, and can be used on your horse's legs and head. A wide-tooth comb allows you to work any tangles out of your horse's tail while minimizing the amount of tail hairs you pull out. Rubbing your horse down with a clean hand towel after you are finished brushing him removes the last bit of dust and will really make him shine. Finally, the most indispensable piece of grooming equipment for every horse owner is a hoof pick. Whether you pick up a plastic or metal one doesn't matter, but clean your horse's feet out before and after every ride, and, if you don't ride often, make it a point to check his feet daily.